Global warming and health hazards from higher NO2 emissions have definitely become some of the greatest challenges of our time and governments all over the world are becoming united in moving away from fossil fuels and towards cleaner energy sources. The global industry is recognizing these trends and we are already seeing big shifts towards battery-charged products – not only when it comes to personal devices such as mobile phones and laptops - but also in electric vehicles and grid batteries used to store electric power for houses and buildings. The Internal Combustion Engines (ICE) used in vehicles are one of the main contributors to the CO2 emissions. According to the data from US Environmental Protection Agency (EPA), transportation accounted for 14% of total greenhouse gas emissions. Almost all of that (95%) is coming from petroleum-based fuels, largely gasoline and diesel. Diesel engines are generally believed to be more polluting than regular petrol cars, particularly because of higher emissions of NO2 (Nitrogen-Oxide). A 2017 study 'estimates that roughly 10,000 premature deaths annually can be attributed to NOx emissions from diesel cars, vans and light commercial vehicles'. Emission cheating scandals like ‘Dieselgate’, which blew up at Volkswagen in 2015, further contributed to discrediting the diesel powered vehicles. It is therefore not surprising that many European countries are starting to pass legislations that will significantly reduce the number of (or even fully ban) diesel vehicles in the upcoming future. They are also heavily promoting the move towards hybrid or all-electric vehicles. Several major European cities such as Paris, Athens or Madrid have declared to ban diesel powered vehicles from their city centers by 2025. Maybe the most significant event related to diesel engines, was the ruling by the Germany's Federal Administrative Court in Leipzig stating that cities may be permitted to put driving bans in place for diesel vehicles. This is seen by many observers as the ‘nail in the coffin’ for diesel powered cars especially in Western Europe. In Germany, where some 70 cities exceeded EU limits for NO2 emissions last year, this ruling has paved the way for cities such as Stuttgart, Dusseldorf or Hamburg to enhance their efforts in banning diesel cars from their roads. China is maybe the most aggressive of all countries when it comes to moving away from ICEs due to the heavy pollution problems in their densely populated cities. The plan is that 12% of all cars sold by 2020 should be electric. Other major countries are following the lead; France and UK plan to end the sale of new petrol and diesel cars by 2040. The Indian government is aiming for 30% of its vehicle fleet to be all-electric vehicles by 2030. A new study by AlixPartners says that diesels’ share of the European market has already fallen from 52% to 45% between 2016 and 2017. They expect diesel-powered vehicles to fall to just 5% of the EU car market. The car manufacturers are moving with the electric vehicle wave. At the Geneva Car Show in March 2018, Toyota announced that it will stop the sale of diesel cars in Europe and will not develop new diesel technology for passenger cars as the company shifts its focus on hybrid vehicles. Nissan also announced that it will phase out diesel versions of passenger cars in Europe and move more towards hybrid and electric vehicles. US-Italian auto giant, Fiat-Chrysler, announced in February that it will ditch diesel from all its passenger cars by 2022. The trend is clearly moving towards electric vehicles. It is even fair to say that we have passed the point of no return, despite the fact that EVs are still not yet mainstream due to insufficient charging infrastructure. Nevertheless, the numbers are clearly indicating a bright future for EVs. 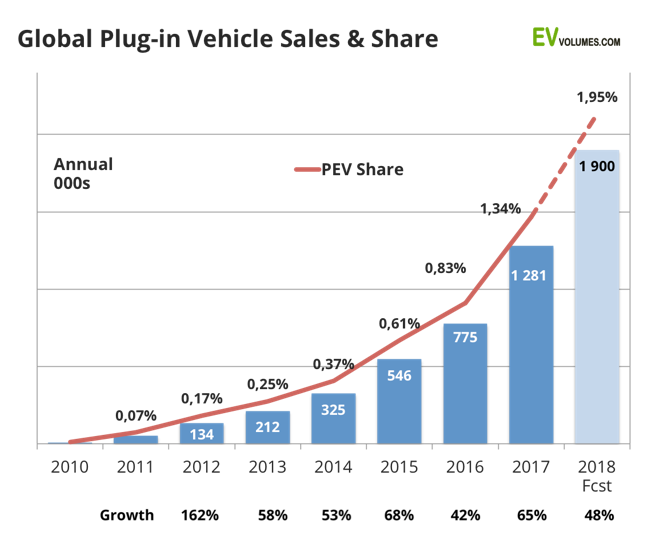 According to ev-volumes.com the sales of Plug-in Electric Vehicles (PEVs) have quadrupled since 2014 to reach over 1.2 million at the end of 2017. However, the share of all PEV sales still represents only 1.34% of total global cars sold in 2017. If these trends continue, the share of PEV sales are projected to reach 2%, which would amount to over 1.9 million cars sold in 2018 – an annual 48% increase. This is still a very small number relative to total car sales, and the growth potential is therefore obvious. The International Energy Agency expects the number of electric vehicles on the road to increase from 2 million in 2016 to 70 million by 2025! In order to facilitate this EV growth, the industry will need to procure a sufficient amount of EV batteries to power the electric cars of the future. Tesla is already building its majestic Gigafactory with planned annual battery production capacity of 35 gigawatt-hours (GWh). Tesla has announced the construction three more Gigafactories with the possibility of more being planned in the years ahead. In 2015, China surpassed the US as a world’s biggest market for electric cars. It is no wonder that China, as a world manufacturing super-house, is already ahead of most global EV battery producers. Contemporary Amperex Technology (CATL), China’s largest automotive battery maker, is already producing a capacity of 17.5 GWh. As reported by Bloomberg, CATL recently announced a plan for a new IPO backed by Goldman Sachs aiming to raise $2 billion to build their own ‘Gigafactory’ with a planned capacity of 24 GWh. The combined capacity would thus exceed even that of Tesla’s Gigafactory! It is therefore a fair assessment that together with BYD (the world's largest maker of electric vehicles) and strong support (in form of various subsidies) from the Government, China is set to cement itself as a future leader in EV battery production. It is also worth noting that there are more than 50 electric vehicle brands in China alone. The big established auto makers also don’t want to be left behind in the EV race. German car giant Volkswagen just recently doubled its initial order of EV batteries to EUR 40 billion (USD 48 Billion); the order alone is worth more than Tesla’s market value! VW also plans to produce 25 new electric models and more than 20 plug-in hybrids by 2020 which is in line with their annual sales target of 3 million electric vehicles in 2025. Although the production of EVs at this moment is still costly compared to standard ICE cars, the industry is expecting the costs of EV batteries to decline significantly in the near future. In 2010, the cost of a lithium-ion packed battery was around 1,000 USD/KWh. 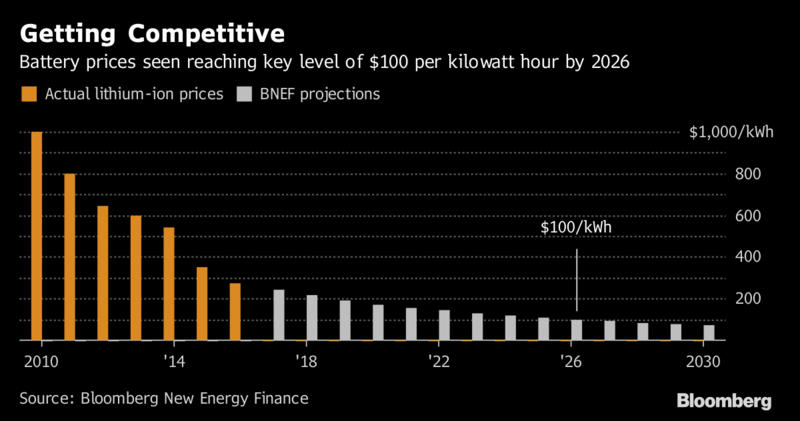 According to Bloomberg New Energy Finance (BNEF), the average price of a lithium-ion battery pack could now be under $200/KWh. 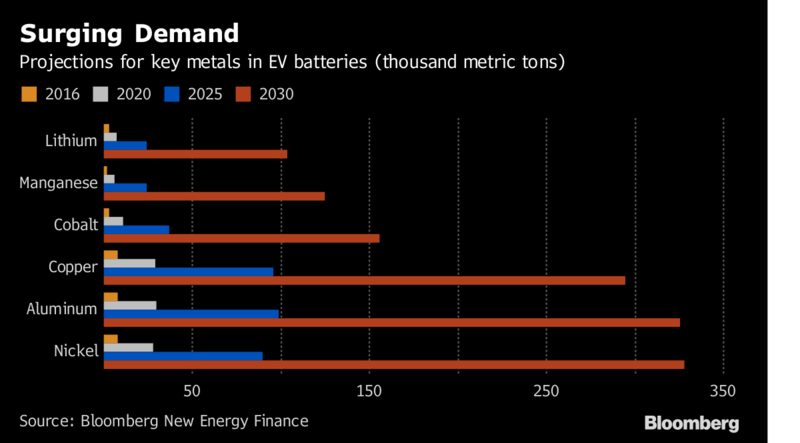 Battery prices will need to drop below 100 USD/KWh for electric vehicles to be competitive with ICE cars; which BNEF projects will happen by 2025. This will be achievable with high performance NMC 811 and NCA cathode batteries containing 80% nickel. Considering the fact that EVs require only half the production floor and capital expenditures compared to equivalent ICE cars, it seems that it is a now more a question of when, rather than if, this goal will be reached. The cost of EV batteries is dependent on the cost of the raw materials needed to produce them. These materials include lithium, nickel, cobalt, manganese, aluminum and copper. They are used in different amounts depending on the battery chemistries used. Auto and battery manufacturers are already scrambling to secure these raw materials with battery metal suppliers to ensure uninterrupted production of lithium-ion batteries. For example, Toyota Group’s trading arm took a stake in Australian lithium miner Orocobre in January 2018 to secure supplies of battery ingredients needed for electric vehicle battery production. South Korean battery maker SK Innovation signed an off-take agreement with Australian Mines Ltd in February 2018 for nickel and cobalt from the latter’s flagship Sconi project. In March 2018, Chinese recycling giant GEM signed a three-year cobalt supply agreement with Swiss miner Glencore.